Back to school. This time always signified the winding down of summer. Growing up in Southwest Florida, just minutes from a multitude of beaches, my friends and I spent as much time as possible soaking up rays Ft. Myers Beach. Sand between my toes, baby oil and iodine on my skin and warm, ok, hot sun rays were my heaven. It’s a wonder my skin doesn’t show more sun damage. But even in Florida, where it never truly gets cold, at least not for long, days spent at the beach generally ended soon after the start of school. Beach time from October to mid-March was left strictly to the snow-birds and tourists. One not too hot afternoon, I was able to get away from the house and I headed into Dahlonega. While walking along the square I saw something new; a small wine store tucked down the stairs from another new store. I wandered in and was perusing the bottles when the owner steered be towards what he claimed was a wonderful Ripasso, 2011 Cesari “Mara” Valpolicella Ripasso Superiore . I decided to give it a shot and truly glad I did. Plum, cedar and cigar box aromas. Ripe dark fruits full of blackberry, cassis with a hint of black cherry on the finish. Full bodied, firm, well structured tannins. We paired with Italian gravy and pasta. The gravy was made using fresh from the summer garden tomatoes and was a divine pairing. The Valpolicella region of Italy is known for its wine and ranks second behind Chianti in production. Typical varietals include Corvina Veronese, Rondinella and Molinara used in a variety of wine styles. Cesari Mari is made in the style of Ripasso, a form of Valpolicella Superiore made from a second fermentation using dried grape skins form that same year’s vintage. Well here we are, coming up on the long Labor Day weekend, the unofficial end of summer. I’m not sad summer is ending, I am sad it will get dark sooner. The leaves in my area have been slowly changing since the first week of August and the Old Farmer’s Almanac predicts this winter will be colder than last year’s. Sigh…good thing we have lots of fire wood available. Here’s to the unofficial end of summer. 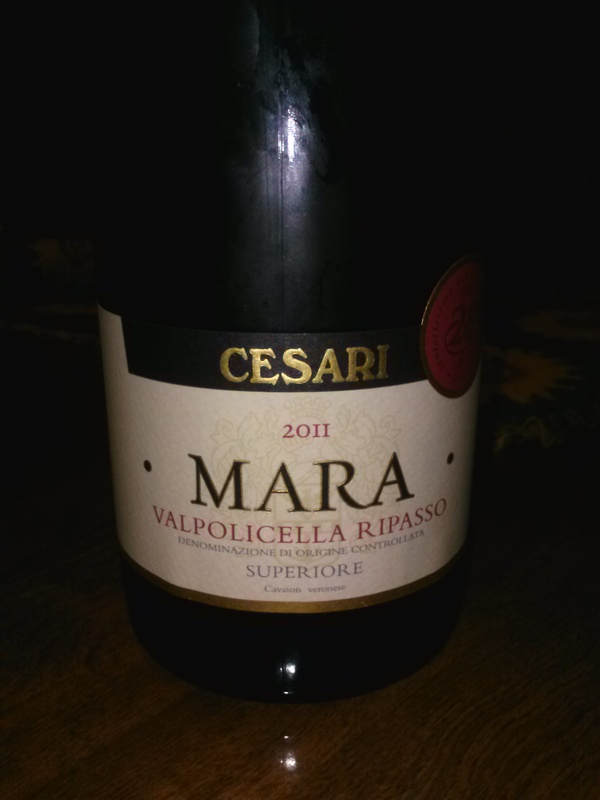 This entry was posted in Italy, Red wine, Wines under $30 and tagged Cesari “Mara” Valpolicella Ripasso Superiore, Italian Red Wine, Ripasso Wine, Valpolicella wine region, Wine Chicks Guide. Bookmark the permalink.